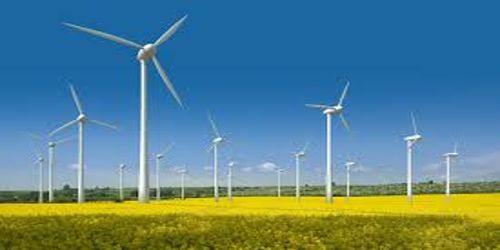 Wind power is the kinetic energy of wind, harnessed and redirected to perform a task mechanically or to generate electrical power. Winds are caused by the uneven heating of the atmosphere by the sun, the irregularities of the earth’s surface, and rotation of the earth. Wind flow patterns are modified by the earth’s terrain, bodies of water, and vegetative cover. This wind flow, or motion energy, when “harvested” by modern wind turbines, can be used to generate electricity. Most modern wind power is generated in the form of electricity by converting the rotation of turbine blades into electrical current by means of an electrical generator. Wind turbines, like aircraft propeller blades, turn in the moving air and power an electric generator that supplies an electric current. Use of wind turbines started around 200, used for pumping water and grinding wheat and other grains. The first windmill in the world built for electrical production was in 1887 in Scotland built by James Blyth. Oil shortages in the 1970s saw a resurgence in interest in wind energy and in the 1980s California started offering incentives for wind development. Today, California produces twice as much wind energy as any other U. S. state, while the wind “gold mine” is supposed to be in the Midwest region between North Texas and North Dakota. Wind energy is a free, renewable resource, so no matter how much is used today, there will still be the same supply in the future. Wind energy is also a source of clean, non-polluting, electricity. It is estimated by the American Wind Energy Association that the use of U. S. wind turbines may reduce the amount of carbon dioxide in the air by one-third. Homeowners by law can sell excess wind energy back to the utility companies. Wind energy replaces electricity from coal-fired power plants and thus reduces greenhouse gases that produce global warming. Farmers can still use the land to graze cattle, and receive land use royalties that have increased their land value. 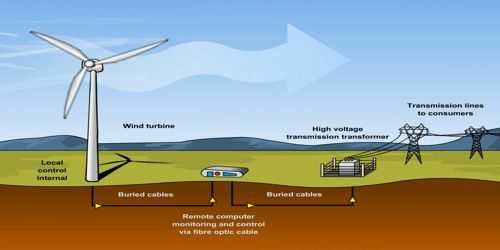 Although wind power plants have relatively little impact on the environment compared to fossil fuel power plants, there is some concern over the noise produced by the rotor blades, aesthetic (visual) impacts, and birds and bats having been killed (avian/bat mortality) by flying into the rotors. Most of these problems have been resolved or greatly reduced through technological development or by properly siting wind plants. Poor research and turbines 20 years out of date are the main problems. Built on a major migratory route for large birds and is also in the middle of the worlds largest golden eagle population. Proper planning and a growing trend in offshore farms bodes well for birds in the future. 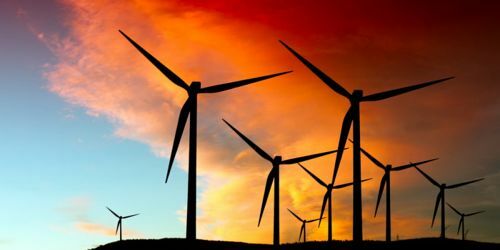 Wind energy is plentiful, renewable, widely distributed, clean, and reduces toxic atmospheric and greenhouse gas emissions if used to replace fossil-fuel-derived electricity. The intermittency of wind seldom creates problems when using wind power at low to moderate penetration levels. The potential of wind power on land and near-shore is estimated to be 72 TW, equivalent to 54,000 MToE (million tons of oil equivalent) per year, or over five times the world’s current energy use in all forms.